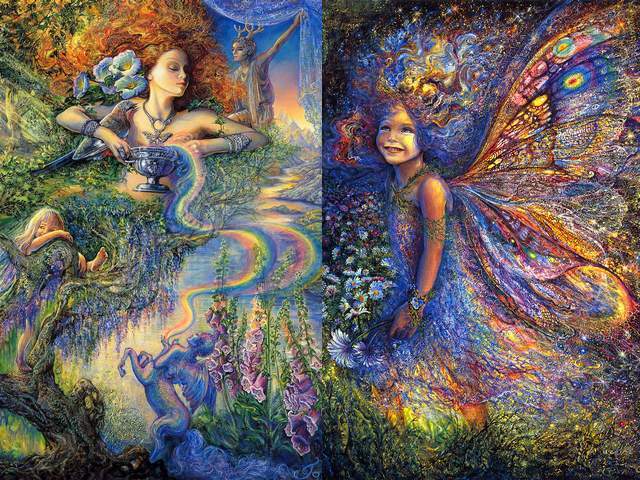 'Enchantment' and 'The Forest Fairy' are two fascinating surreal-like fantasy artworks by Josephine Wall, a mystical journey into the magical world the imagination and kindness. In 'Enchantment' (2003), the beautiful Celtic wood nymph which holds a chalice of Hope, is surrounded by numerous mythical figures. The mission of winged centaur is to spread hers love and support to all living things, which contribute the beauty to our planet. 'Forest Fairy' is a mythical fairy, which wanders through the forest, far from human sight, in awe of all that surrounds her. On the sunlit glade, she happily gathers wild anemones, and delights in the freedom and the nature's bounty.